Gorgeous dark gray trousers made out of an amazing woven lightweight japanese fabric very chic yet casual and everyday wearable has two pockets at front and back works with every outfit. 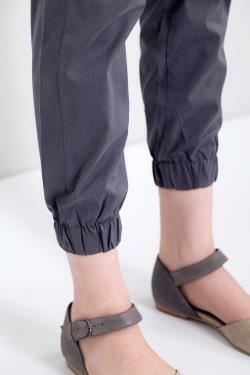 The pants ends at ankle length and has a rubber that creates small ruffles. 98% woven cotton 2% lycra japanese fabric. Size 36 / us 6 / uk 8. Waist: fits waist around 28.7 73 cm. Hips: fits hips around 34.6 / 88 cm. Length: 35.8 / 91 cm. Size 38 / us 8 / uk 10. Waist: fits waist around 30.3 77 cm. Hips: fits hips around 36.2 / 92 cm. Length: 36.2 / 92 cm. Size 40 / us 10 / uk 12. Waist: fits waist around 31.8 81 cm. Hips: fits hips around 37.7 /96 cm. Length: 36.6 / 93 cm. Size 42 / us 12 / uk 14. Waist: fits waist around 33.4 85 cm. Hips: fits hips around 39.3 / 100 cm. Length: 37 / 94 cm. Available also in navy blue. You can find more items at my shop.